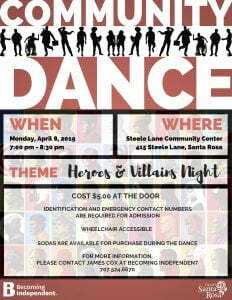 Please join us on Monday, April 8, 2019 from 7:00pm to 8:30pm at the Steele Lane Community Center in Santa Rosa for the Heroes & Villains Night dance! Make sure to wear your dancing shoes – and maybe a cape! – as the DJ will be playing all your favorite songs! All staff, clients, families, and community members are invited to attend! Admission is $5 at the door.